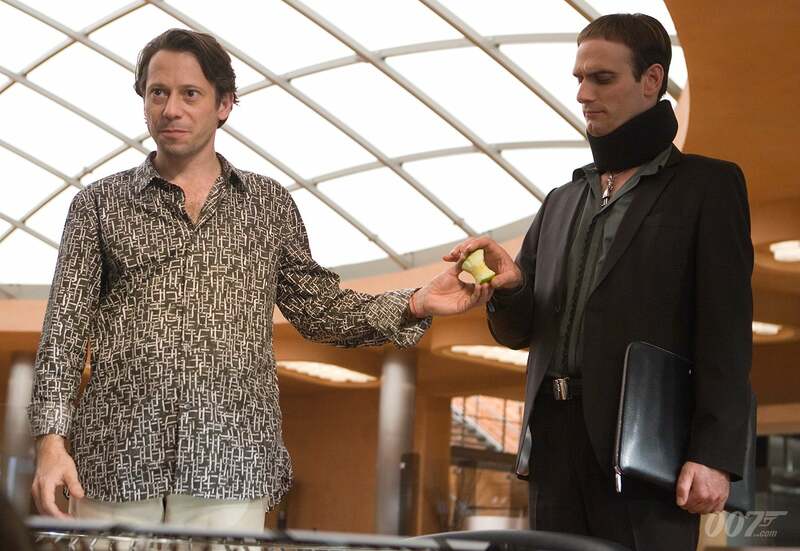 By turns smooth-talking and vindictive, sophisticated but ruthless, QUANTUM OF SOLACE’s Dominic Greene (Mathieu Amalric) is a man of many colours. As the CEO of utilities company Greene Planet, he masquerades as a legitimate, committed conservationist, performing philanthropic work by purchasing large tracts of land for environmental purposes. Yet he has a darker streak too, revealed when, aged 15, he burned the face of one of his mother’s piano students who crushed his unrequited feelings for her. 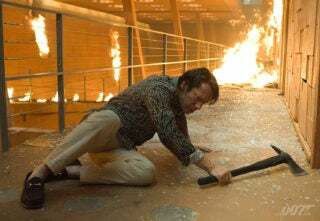 As an adult, Greene is a high-ranking member of sinister organisation Quantum and plots with deposed Bolivian Dictator General Medrano (Joaquin Cosio) to stage a political coup in exchange for a barren piece of land. The seemingly worthless territory is pivotal in Greene’s carefully crafted plot. Green’s ex-lover and employee Camille Montes (Olga Kurylenko) attempts to buy reports from one of the environmentalist’s top geologists regarding the stretch of land known as the Tierra Project. Greene commands the geologist to be killed and sends assassin Edmund Slate (Neil Jackson) to kill Camille. James Bond (Daniel Craig) kills Slate before he can get to Camille. Greene and Medrano meet, the former turns Camille over to the Bolivian dictator to sweeten the deal over the land — he coldly tells Medrano to “throw her over the side” when he’s finished with her. Greene subsequently negotiates a deal with CIA South American Section Chief Gregory Beam to ignore the Bolivian coup in exchange for rights to oil discovered in Greene’s land. Greene also commissions Beam to remove a “pest” — 007. In a high-level Quantum meeting in Austria, concerns are raised over the Tierra Project yet Greene counters that Bolivia must be the organisation’s top priority. Bond and Camille investigate the Project and discover Greene has been inhibiting the delivery of fresh water, holding it in a vast underground reservoir. Greene and Quantum want to control Bolivia’s water supply, convinced that whoever owns the natural resource will be more powerful than the government. At the Perla de las Dunas Hotel in Bolivia, Greene informs Medrano that the country’s already expensive water costs will double when Greene Planet becomes the sole provider. Medrano is faced with a tough choice: to agree to Greene’s demand or face certain death. Bond tracks Greene to the hotel and, after an explosive clash, Bond extracts information from Greene about Quantum before leaving him in the desert with just a can of motor oil — perhaps a nod to the murder of Agent Fields (Gemma Arterton) who Greene previously had drowned in pitch black oil. M (Judi Dench) later informs Bond that Greene has been found with motor oil in his stomach and two bullets in the back of his skull. The environmentalist was executed for leaking secrets by the very organisation he previously served.